The success of the IMCS Rock Climbing Camps is based in our professional instruction and sincere enthusiasm. Kids love to rock climb, meet new friends and learn new skills. 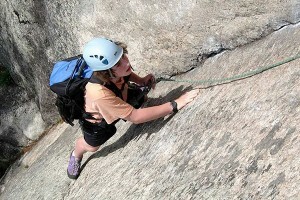 Rock climbing teaches kids patience, cooperation and respect for our the environment. Our guides understand the special care that is required to provide a safe, successful experience for young climbers. We provide rock climbing guiding and instruction for school groups, church groups, summer camps and Scouts throughout the climbing season. 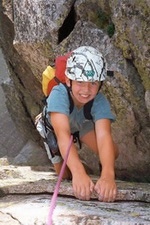 Our climbing programs take place outdoors on the local cliffs in the North Conway area. If you have any questions, concerns or suggestions, we encourage you to give us a call. The safety and quality of our youth climbers’ experience is our highest priority. We want young rock climbers and their parents to feel comfortable with the decision to join IMCS guides for this exciting and challenging camp. Tell us about yourself or your child so we can recommend the most appropriate camp session and discuss details related to the climbing itinerary. This camp is for kids and teens ages 8-17 (split into 8-12 and 13-17 age groups) who do not want a full week of climbing and for parents who wish to avoid the cost of the overnight camp. Climbing will be outdoors all day every day. Climbers can chose to attend one, two or all three days. The day lasts from 9:00am-3:30pm and we meet at IMCS. No previous climbing experience is necessary. Climbers should be comfortable being outdoors all day, able to carry a backpack and must wear comfortable close-toed shoes (sneakers or hiking boots recommended). Please bring your lunch and water for the day, a rain or wind jacket and wear comfortable loose fitting clothing (long or 3/4 length pants work better than shorts with a harness) Bring warmer layers for cooler days. Full payment is required in advance. Cancellations prior to one week before camp will be subject to loss of payment in full. *Prices are based on minimum enrollment of 3.